Thus spoke St. Hilarion, Metropolitan of Kiev, in mid-11th century, when only slightly more than half-a-century had passed from the baptism of Russia. Even at that time the saint already saw with his penetrating gaze the greatness of St. Vladimir’s work, and summoned all Russia to glorify him in a worthy manner. With what words and colors can the work done by St. Vladimir in baptizing Russia be expressed by us who have attained the millennium of this glorious event? Let us remember what Russia was like before Vladimir and what it became after being baptized by him. Here is Russia in the time of “old Igor” or of Svyatoslav, Vladimir’s father. Each tribe lived its own isolated life. Individual clans often fought each other, brought revenge upon each other, and frequently engaged in mutual self-destruction, following the laws of bloody vengeance. Russian princes before Vladimir were conquering leaders rather than fathers and benefactors of their people. Military campaigns and booty attracted them more than concern for their citizens. However, it would be wrong to think that the Slavs possessed only negative traits and were entirely a semi-barbaric crowd. On the contrary, there were many good qualities in their nature. They were hospitable, courageous and honest. Wives were loyal mates to their husbands, often remaining faithful to those who died. The Slavs honored their elders and heeded their advice in matters both private and public. But at the same time they were capable of perfidy, cruelty and craftiness. At times, especially in the course of battle, they became fearsome to those around them. The peaceful Slav became a wild beast. Woe unto them against whom was directed his fury, for he did not spare anyone! Even Byzantium trembled before its northern neighbors, while they themselves often feared each other. Thus the world of Slavs stood at the crossroads of good and evil, at times exhibiting the wonderful qualities of men created in the image of God, at other times exhibiting the terrible signs of beasts in human form. What lofty ideals could there be among the Slavs? To what could their feelings and thoughts be directed? What could inspire them and to what could they aspire? The pagan gods whom they worshipped possessed all the traits of their worshippers, and were an epitome of both their good and bad qualities. The Slavs served the gods they themselves had thought up, thus confirming within them-selves their own frailties and justifying them by their gods’ characteristics. While worshipping the terrible Perun, the Slavs engaged in cruel wars, exterminating their neighbors. It is hard to say what would have become of Eastern Europe had not Saints Cyril and Methodius illuminated the Slavs with the light of Christ and laid the foundation for the enlightenment of the Slavic peoples. Saints Cyril and Methodius, together with their disciples, enlightened some of the Slavic people with the teaching of Christianity. The influence of Christianity soon made itself felt and brought these people into the family of Christian nations. In a short time the nations that became Christian were totally transformed. But the majority of Slavs – the eastern Slavs – continued to live as before. The darkness that hung over the eastern Slavic tribes was so thick and unrelieved that it could not be dispersed even by the first Russian Christian Princess Olga, who sat on the princely throne as a morning star in the sky. It needed the rising of the Beautiful Sun itself, which for Russia was personified by Olga’s grandson – the Great Prince Vladimir. Having acquired the basic principles of the Christian faith from his grand-mother, but having suppressed them by the raging of passions in his youth, Vladimir, severely shaken by the martyric death of the Varangian boyars Theodore and John, decides to change his way of life. After a meticulous examination of the issue of faith, Vladimir makes his choice. Being honest and straightforward by nature, he does not stay in the middle of the road, but chooses that which is best. He becomes enlightened by Orthodoxy and after being baptized becomes a fervent follower of Christ’s commandments. By his example he appeals to his subjects and they follow him. The change in Vladimir is also striking, as from a young man full of lust and unbridled passions he turns into a holy man. But no less striking was the change that took place in the baptized Russia. The baptism of Kiev, with the rest of Russia following, opened up a new life for the eastern Slavs and became the foundation of their glorious history. The divided Slavic tribes that made up Vladimir’s kingdom suddenly felt united after converting to Christianity. The feeling of unity was particularly strengthened by the fact that in clerical terms the entire Russia made up a single religious metropolis over the course of several centuries, despite the subsequent division of Russia into fiefdoms. The Church had the greatest influence in uniting Russia into one nation. With the spreading of Orthodoxy among them, not only Slavic, but other tribes living in Eastern Europe merged into one with the Russian people. Acting as a peacemaker during internecine strife, the Church at the same time instilled the realization that the Russian people were one and must, therefore, be in all ways a single entity. Russia was formed under the tutelage of the Holy Orthodox Church, became strong and grew into a mighty nation covering one-sixth of the globe. The Russian people, having converted to Christianity of their own free will, from the very first years after baptism aspired to incorporate the teaching of the Gospel into their life. The baptism regenerated and internally changed the formerly coarse people. Retaining their previous good qualities, they now freed themselves of their bad traits. The battle between good and evil took place not only in Vladimir’s soul, but in the entire people, and a turning point for the good occurred. After their baptism the Russian people were no longer what they had been before. They truly became a “new people” of the Gospel. This does not mean that everyone immediately became perfect, that evil disappeared from the soul of every person and no longer existed in Russia. Not at all! Evil continued to exist and continued its struggle with good in each person. However, Orthodoxy now became the moving force of the Russian people, enveloping all aspects of life – personal, social, and national. Both family and public life became permeated with the spirit of the Gospel; viewpoints were acquired under the influence of church rules, while government laws were created in agreement with the canons. The general life of the Russian people was now directed towards a search for God’s truth. The striving to attain God’s truth permeated all the laws of the country, all executions of justice, and all government measures. The same striving to serve God marked the intellectual and the religious life of the Russian people. Almost all aspects of its cultural life arose from church life and developed under the influence of the Church. Of course, not everything in Russia fell in with this general trend. A great deal of evil was committed in it throughout the past centuries. If there is not a single person without sin, even more so can there not but be sin and evil in the history and life of a nation. However, just as a person is primarily characterized by the traits that are most vivid in him and overshadow others, so a nation is characterized by the main content of its spiritual life. For Russia and the Russian people, despite all past deviations and even falls, the main thing was service to truth and the standing in truth. When we think of ancient Greece, we remember the words of Apostle Paul: “The Hellenes seek wisdom.” The thought of Sparta is connected with the idea of physical excellence. Phoenicia has appended its name to commerce. Rome boasted of its great valor. But the Russian people have acquired the epithet of God-carriers and the Russian land that of Holy Russia. Russia is holy for the multitude of saints it has produced. Beginning with the sons of St. Vladimir – the righteous princes Boris and Gleb, and from the baptizer of Russia himself – St. Vladimir, together with his holy grandmother Olga, an innumerable assembly of saints lived and shone with holiness and miracles in the Russian land. Those holy saints were flesh from flesh and bone from bone of the Russian people. They were not alien to the people in their beliefs and way of life, but were truly the most vivid expression of their people’s aspirations. From the baptism of Russia and up to our own days there was not a single hour in which some saint or other did not live somewhere in the Russian land and after his death became an intercessor for Russia. All Russian provinces had their own spiritual laborers. Every place, every corner was sanctified by service to God. The history of Russia is the history of God’s work. The influence of Russia’s saints on its historical events is so great that it is impossible to separate the history of the Russian nation from the history of its Church. The customs and the way of life of the Russian people were permeated with religiousness. Even Russia’s foreign policy was in many ways an expression of its spiritual image. So it used to be… But where are you now, Holy Russia? Or do you no longer exist? The throne of St. Vladimir has fallen, the sacred icons have been desecrated, the churches have been destroyed. How did the place of spiritual feats become the place of vile crimes, and where saints formerly attained salvation, gangsters now rule? Is Holy Russia no longer and will never be? No! Holy Russia is not self-deception or an illusion, but true reality! The incense of the prayers of Russian saints continues to rise in the heavens, interceding for their land before the throne of God. However, it is not only in heaven, but also here, on our sinful earth, that Holy Russia continues to exist. The rule of the apostates has only subjugated, but not destroyed it. A foreign international power has placed a yoke on it, but remains its enemy. And Russia remains holy. Christ’s apostles did not become less holy when Judas fell away from them, and the brightness of the angelic host was not dimmed when Satan and his followers fell away from it. Just as Satan had to come out of the angelic host, but with the falling away of him and his followers the remaining angels became fired with even greater love for God and shone even brighter in heaven, so the apostates originated among the Russian people, but their falling away revealed the holiness of Russia even more clearly, and glorified Russia both in heaven and in the entire universe. A countless assembly of new martyrs has confirmed its loyalty to Christ. The entire Russian people, with incredible patience bearing suffering the equal of which has never been experienced by any other people in the world, produced a great multitude of new confirmations of steadfastedness in faith. Despite the cruelest persecution, the Church remains invincible. In the great assembly of God’s saints glorified in Russia, there have been many hierarchs, righteous ones, monastics and fools-for-Christ. But in former times there have been very few martyrs. And now the time came to fill up the ranks of the heavenly Russian Church. To the small number of martyrs and passion-bearers of former centuries was now added a countless number of new martyrs. Among them were the Tsar with his entire family, hierarchs, princes, soldiers, priests, monastics, learned men and illiterates, city-dwellers and peasants, aristocrats and commoners. 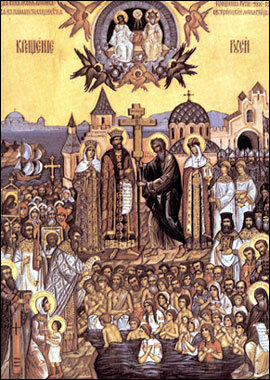 All ages, all classes, all regions of Russia gave new martyrs. All of Russia was flooded with the blood of martyrs, was sanctified by it. O wondrous and glorious army of new martyrs! Who can honor you in a worthy manner! Blessed are thou, O Russian land, purified by the fire of suffering! Shake off your despondency and indolence, sons of Russia! Gaze at the glory of its suffering and purify yourselves, cleanse yourselves of your sins! Fortify yourselves in the Orthodox faith, in order to be worthy of residing in the abode of the Lord and dwelling in His holy mount!